Based on a popular LED chaser design, this enhanced version actually chases back and forth. A popular effect often used in Hollywood, the Back-Forth LED Flasher is available in several stunning colors including Blue and White. Comes with a 9V battery clip and adjustable speed control (9V battery not included). The unassembled kit includes instructions (including schematic and parts placement) and all the components to build one complete Back-Forth LED Flasher Kit. A soldering iron, solder and a pair of cutters are required for assembly. User selectable direction for left, right or back-forth sequencing effects. Adjustable flash rate from nearly continuous to several seconds. 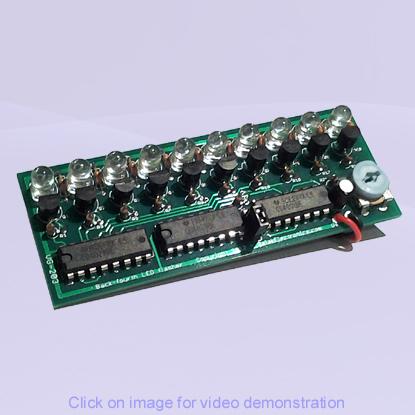 Uses a single 9V battery and consumes just 20mA regardless of flash rate. High Intensity water clear LEDs available in a variety of colors including blue and white. LEDs can be easily mounted on the back of the PC board for low profile configurations.